Opposition calls for conflict to be resolved through resumption of peace talks - even though Hamas has broken five ceasefires. 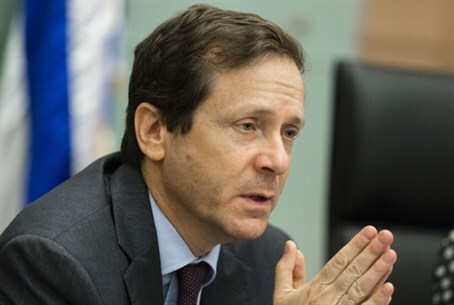 Opposition leader Yitzhak Herzog (Labor) has called on Prime Minister Binyamin Netanyahu to resume peace talks on Sunday, claiming that the peace process is the only way to end Operation Protective Edge in Gaza. "We have removed the terror threat of tunnels substantially, but demilitarization and a full return to quiet will not materialize without a political solution," Herzog insisted. "The campaign in Gaza has created a unique opportunity to strengthen the alliance with moderate forces in the Arab world," he added, noting that such a possibility is only available - in his words - through establishing a Palestinian state. "Now is the time to launch Operation Protective Edge on the political front," Herzog claimed. "If Netanyahu does not use this rare opportunity now, then there will be an even greater cycle of violence in the future." Several nationalist MKs have cited the opposite to be true, noting that if the IDF does not decimate Hamas now without compromises, it will give the terror group time to re-arm - this time, with potentially more deadly weapons. MKs arguing along these lines have drawn on the root of the conflict: Israel's withdrawal from Gaza in 2005, which left a vacuum of power that ended with the election of Hamas into power in 2007. Moreover, Hamas is now still, technically, in a unity government with the Palestinian Authority's Fatah and would be involved in talks. Netanyahu has repeated over and over again that Hamas cannot be trusted in diplomatic affairs, a fact underscored by its violation of an internationally-brokered cease-fire Friday - the fifth such violation in a 27-day period. Despite this, Herzog is not the only leftist to push peace; Meretz Chairman Zehava Gal-On blasted Netanyahu Sunday for continuing the operation as well. "It's back to the good old strategy of Netanyahu controlled military conflict management rather than be political negotiations for peace," she fired. "Rather than internalize the conflict, and realizing that the way to solve this is through Ramallah, he rejects the political process - only strengthening Hamas and weakening moderate elements in Gaza."